Microsoft Teams turns one today. Happy birthday, Teams! 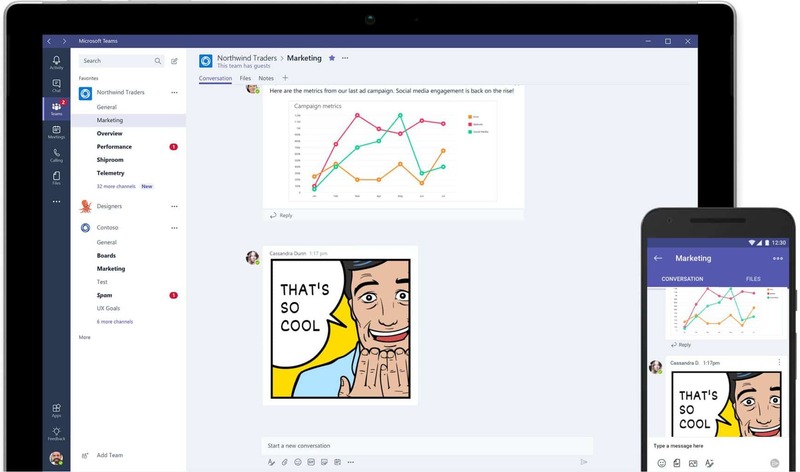 Microsoft Teams, the company’s team collaboration software and challenger to Slack, announced this morning- on its first anniversary – a suite of new features that will roll out to the software throughout 2018. This includes features that will allow users to record, transcribe and save meetings to the cloud, integrations with voice assistant Cortana, inline message translation and several others. Microsoft and Amazon announced last year their voice assistants, Cortana and Alexa, would work together, for example. Meanwhile, companies – including Microsoft – have been working to make their applications and services work well with voice assistants given the potential of voice computing in the workplace. Also coming in 2018 is cloud recording – another that takes advantages of advances in voice technology in recent years. Microsoft Teams will be able to record meeting with a click, then create an automatic transcription of what was said. Meeting attendees can choose to playback the meeting in full, or just a key part, using the transcription as reference. This last item will allow attendees to share a live video stream, photo, or screen share from their mobile device. In addition to the planned features, Microsoft announced new enterprise-grade calling features arriving today, including consultative transfer and call delegation and federation. It’s also now rolling out Direct Routing, which allows customers to integration existing telephony infrastructure with Teams for calling. Related to this, Teams is also now enabled across meeting room devices including Microsoft Surface Hub; devices from new partners Lenovo and HP (which join Logitech, Crestron, and Polycom); Skype Room Systems; new solutions from BlueJeans, Pexip, and Polycom that will connect with Teams; new desk phones from AudioCodes and Yealink and new conference room phones from Crestron, Polycom, and Yealink, all of which will run a native Teams app; and new mobile phone stations from Plantronics. Microsoft today gave an update on Teams’ traction, given it’s now been a year since its worldwide debut. There are today 200,000 organizations in 181 markets and 39 languages on Teams, including A.P. Moller–Maersk, ConocoPhillips, Macy’s, NASCAR, Navistar, RLH Corporation, and Technicolor, and, as of another announcement today, General Motors. By comparison, Slack reports 9 million weekly active users across 50,000+ paying companies in over 100 countries, according to stats on its website. It has said in September, it had grown to more than 6 million daily users, as well. This article was first reported by Sarah Perez on TechCrunch. Cut the cord with your desk phone and access your Teams wherever life takes you.